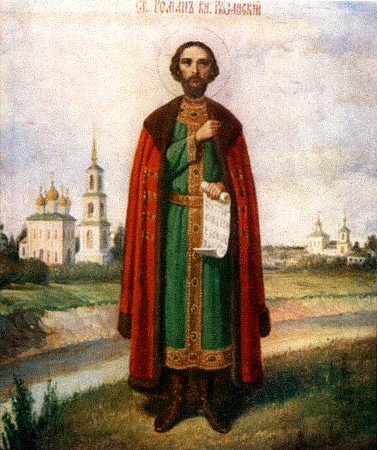 The Holy Nobleborn Prince Roman Olegovich of Ryazan was from a line of princes, who during the time of the Tatar (Mongol) Yoke won glory as defenders of the Christian faith and of their Fatherland. Both his grandfathers perished for the Fatherland in the struggle with Batu. Raised in love for the holy faith (the prince lived in tears and prayers) and for his Native-land (Rodina), the prince with all his strength concerned himself about his devastated and oppressed subjects, and he defended them from the coercion and plundering of the khan's "baskaki" ("tax-collectors"). The "baskaki" hated the saint and they slandered him before the Tatar khan Mengu-Timur. Roman Olegovich was summoned to the Horde, where khan Mengu-Timur declared that he had to choose either of two things: either a martyr's death or the Tatar faith. The noble prince answered, that a Christian cannot change from the true faith to a false one. For his firmness in the confession of faith he was subjected to cruel torments: they cut out his tongue, gouged out his eyes, cut off his ears and lips, chopped off his hands and feet, tore off from his head the skin and, having chopped off his head, they impaled him upon a spear. This occurred in the year 1270. The veneration of the prince-martyr began immediately with his death. The chronicle says about the saint: "Thou hast gained by thy suffering the Kingdom of Heaven and a crown bestown from the hand of the Lord together with thy kinsman Mikhail Vsevolodovich, co-sufferers with Christ for the Orthodox Christian faith". From the year 1854 there was made at Ryazan a church procession and molieben on the day of memory of Saint Roman. In 1861 at Ryazan was consecrated a church in honour of holy Prince Roman.